bringing retailers & shoppers together on a user friendly platform. RushForLess is a user friendly, fast paced, personal, and dynamic platform that brings retailers and shoppers together. RushForLess is a dedicated and engaging tool for retailers to clear their excess inventory or sell a promotion at a faster rate. 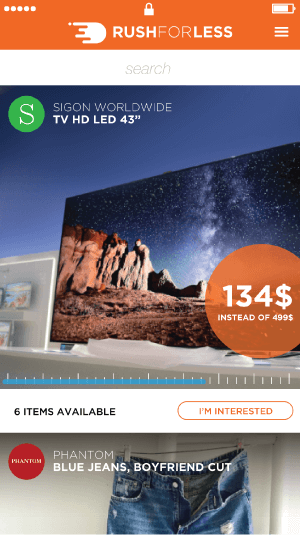 RushForLess is a captivating and hassle free mobile app for shoppers that helps them find relevant items and access limited time offers that feature incredible retail brands at exceptional prices. A starter package that gives you all what you need to push your offers to 5,000 interested nearby users. Engage with a crowd of 10,000 interested nearby users while benefiting from more offers per month, a greater geofence and much more pushes/month. Reach the greatest audience with our suppa duppa plan, unlimited offers per month to unlimited interested users. Prices are applicable in 2018 only. We reserve the right to change our product's prices at any time without further notice. However, if you have ordered but not yet paid for a product, we guarantee the price for one month from when the order was placed. Online payment isn't available yet. Please send us your request through our email "info@rushforless.com"
Your email was successfully sent ! RushForLess team will get back to you as soon as possible. If you browse or otherwise access any content or data on the RushForLess.com website/application, you agree to be bound by these terms. If you do not agree to these terms, please do not use this website/application. By accessing and/or using the Website/application and/or the Service, you agree to comply with these Terms. Additionally, when using a portion of the Service, you agree to conform to any applicable posted guidelines for such Service, which may change or be updated from time to time at “Rush for Less’s” sole discretion. You are solely responsible for reviewing these Terms from time to time. Should you object to any term or condition of these Terms, any guideline, or any subsequent changes thereto or become unhappy with “Rush for Less” or the Service in any way, your only choice is to immediately discontinue use of the Website/application and the Service. These Terms may be updated by “Rush for Less” at any time at its sole discretion. “Rush for Less” may send you notices of changes to the Website/application or the Terms. In this section: - the legal responsibilities and liabilities of “Rush for Less” are excluded or limited; - you take on risk, responsibilities and liability; and - any rights you have against “Rush for Less” are limited or excluded. The statements made in this section constitute acknowledgements of fact by you. You must read these statements carefully and ensure they are correct, as you will not be able to deny the truth of the statements. “Rush for Less” and/or other persons may have claims and other rights against you as a result of these statements. “Rush for Less” acts as a venue to allow our users who comply with these Terms to offer, sell, and buy products and services listed on the Website/application. Although you may be able to conduct payment and other transactions through the Website/application, using third-party vendors, “Rush for Less” is not in any way involved in such transactions. As a result, and as discussed in more detail in these Terms, you hereby acknowledge and agree that “Rush for Less” is not a party to such transactions, has no control over any element of such transactions, and, as far as the law allows, shall have no liability towards any party in connection with such transactions. As far as the law allows, you use the Service and the Website/application at your sole risk and responsibility. You understand that “Rush for Less” is not responsible for ads, directory information, business listings/information, messages between users, including without limitation e-mails or chats or other means of electronic communication, whether through the Website/application or another Third Party Website/application (defined below) or offerings, comments, user postings, files, images, photos, video, sounds, business listings/information and directory information or any other material made available through the Website/application and the Service ("Content"), and that by using the Website/application and the Service, you may be exposed to Content that is offensive, indecent, inaccurate, misleading, or otherwise objectionable. As far as the law allows, you are responsible for and must evaluate, and bear all risks associated with, the use of any Content. You may not rely on said Content, and under no circumstances will “Rush for Less” be liable in any way for the Content or for any loss or damage of any kind incurred as a result of the browsing, using or reading any Content listed, e-mailed or otherwise made available via the Service. “Rush for Less” is not obliged to pre-screen or approve any Content, but “Rush for Less” has the right, in its sole and absolute discretion, to refuse, delete or move any Content that is or may be available through the Service, for violating these Terms and such violation being brought to “Rush for Less’s” knowledge or for any other reason or no reason at all. Furthermore, the Website/application and Content available through the Website/application may contain links to other third party website/applications ("Third Party Website/applications"), which are completely unrelated to “Rush for Less”. If you link to Third Party Website/applications, you may be subject to those Third-Party Website/applications’ terms and conditions and other policies. As far as the law allows, “Rush for Less” makes no representation or guarantee as to the accuracy or authenticity of the information contained in any such Third-Party Website/applications, and your linking to any other website/applications is, as far as the law allows, completely at your own risk and “Rush for Less” disclaims all liability thereto. As far as the law allows, you are solely responsible for your own Content posted on, transmitted through, or linked from the Service and the consequences of posting, transmitting, linking or publishing it. More specifically, you are solely responsible for all Content that you upload, email or otherwise make available via the Service. In connection with such Content posted on, transmitted through, or linked from the Service by you, you affirm, acknowledge, represent, warrant and covenant that: (i) you own or have and shall continue to, for such time the Content is available on the Website/application, have the necessary licenses, rights, consents, and permissions to use such Content on the Service and Website/application (including without limitation all patent, trademark, trade secret, copyright or other proprietary rights in and to any and all such Content) and authorize “Rush for Less” to use such Content to enable inclusion and use of the Content in the manner contemplated by the Service, the Website/application and these Terms; and (ii) you have the written consent, release, and/or permission of each and every identifiable individual person or business in the Content to use the name or likeness of each and every such identifiable individual person or business to enable inclusion and use of the Content in the manner contemplated by the Service, the Website/application and these Terms. For clarity, you retain all of your ownership rights in your Content; however, by submitting any Content on the Website/application, you hereby grant to “Rush for Less” an irrevocable, non-cancellable, perpetual, worldwide, non-exclusive, royalty-free, sub-licensable, transferable license to use, reproduce, distribute, prepare derivative works of, display, and perform the Content in connection with the Website/application and “Rush for Less’s” (and its successors') business, including without limitation for the purpose of promoting and redistributing part or all of the Website/application and Content therein (and derivative works thereof) in any media formats and through any media channels now or hereafter known. These rights are required by “Rush for Less” in order to host and display your Content. Furthermore, by you posting Content to any public area of the Service, you agree to and do hereby grant to “Rush for Less” all rights necessary to prohibit or allow any subsequent aggregation, display, copying, duplication, reproduction, or exploitation of the Content on the Service or Website/application by any party for any purpose which contravenes these Terms. These rights are perpetual and cannot be revoked by you and will apply and can be exercised throughout the world. You also hereby grant each user of the Website/application a non-exclusive license to access your Content through the Website/application (this license excludes scrapping cases and any other possible use with commercial purposes). The foregoing license to each user granted by you terminates once you or “Rush for Less” remove or delete such Content from the Website/application. “Rush for Less” does not endorse any Content or any opinion, statement, recommendation, or advice expressed therein, and, as far as the law allows, “Rush for Less” expressly disclaims any and all liability in connection with user Content. “Rush for Less” does not permit copyright infringing activities and infringement of intellectual property rights on the Website/application, and “Rush for Less” may, at its sole discretion, remove any infringing Content. “Rush for Less” reserves the right to remove any Content without prior notice. “Rush for Less” may also terminate a user's access to the Website/application, if they are determined to be a repeat infringer or found to be indulging in any act contrary to these Terms. A repeat infringer is a user who has been notified of infringing activity more than once and/or has had a user submission removed from the Website/application more than once. Further, at its sole discretion, “Rush for Less” reserves the right to decide whether any Content is appropriate and complies with these Terms. Use any automated device or software that enables the submission of automatic postings on “Rush for Less” without human intervention or authorship (an "automated posting device"), including without limitation, the use of any such automated posting device in connection with bulk postings, or for automatic submission of postings at certain times or intervals. “Rush for Less” may charge a fee to boost Content in some specific areas of the Service (Offer Pushes). The fee permits Paid Content to be posted in a designated area of the Website/application and to a certain number of users. Each party posting Paid Content to the Service is responsible for the Content and compliance with the Terms. Any such fees paid hereunder are non-refundable in the event any Content is removed from the Service for violating these Terms. Additional terms regarding Paid Content will be fully stated in the applicable section(s). As used herein, the term "Posting Agent" refers to a third-party agent, service or intermediary that offers to post Content to the Service on behalf of others. “Rush for Less” prohibits the use of Posting Agents, directly or indirectly, without the express written permission of “Rush for Less”. In addition, Posting Agents are not permitted to post Content on behalf of others, directly or indirectly, or otherwise access the Service in order to post Content on behalf of others, except with express written permission or license from “Rush for Less”. “Rush for Less” grants you a limited, revocable, non-exclusive license to access and use the Service for personal use. This license granted herein does not include any of the following: (a) access to or use of the Service by Posting Agents; or (b) any collection, aggregation, copying, duplication, display or derivative use of the Service nor any use of data mining, robots, spiders, or similar data gathering and extraction tools for any purpose unless expressly permitted by “Rush for Less” or as otherwise set forth in these Terms. Notwithstanding the foregoing, general purpose internet search engines and non-commercial public archives that gather information for the sole purpose of displaying hyperlinks to the Service, provided they each do so from a stable IP address or range of IP addresses using an easily identifiable agent and comply with our robots.txt file, may engage in the activities set forth in (b). 7.7 A signed statement that the information in the notification is accurate and under penalty of perjury that you are authorized to act on behalf of the owner of an exclusive right that is allegedly infringed. The materials on the Website/application, other than the user Content that you licensed under these Terms, including without limitation, the text, software, scripts, graphics, photos, sounds, music, videos, interactive features and the like ("Materials") and the trademarks, service marks and logos contained therein ("Marks"), are owned by or licensed to, and are subject to copyright and other intellectual property rights. In connection with the Services, the Website/application may display certain intellectual property goods belonging to third parties. Use of these goods may be subject to license granted by third parties to “Rush for Less”. You shall, in no event, reverse engineer, decompile, or disassemble such goods and nothing herein shall be construed to grant you any right in relation to such goods. Materials on the Website/application are provided to you AS IS for your information and personal use only and may not be used, copied, reproduced, distributed, transmitted, broadcast, displayed, sold, licensed, or otherwise exploited for any other purposes whatsoever without the prior written consent of the respective owners. “Rush for Less” reserves all rights not expressly granted herein to the Website/application and the Materials. You agree to not engage in the use, copying, or distribution of any of the Materials other than as expressly permitted herein, including any use, copying, or distribution of Materials of third parties obtained through the Website/application for any commercial purposes. You agree not to circumvent, disable or otherwise interfere with security related features of the Website/application or features that prevent or restrict use or copying of any Materials or enforce limitations on use of the Website/application or the Materials therein. Content displayed on or through the Service is protected by copyright as a collective work and/or compilation, pursuant to copyrights laws, other laws, and international conventions. Any reproduction, modification, creation of derivative works from or redistribution of the Website/application, the Materials, or the collective work or compilation is expressly prohibited. Copying or reproducing the Website/application, the Materials, or any portion thereof for further reproduction or redistribution is expressly prohibited. This Section 9 has important legal consequences for you. In this section: - the legal responsibilities and liability of “Rush for Less” are limited or excluded; - the rights or remedies you may have against “Rush for Less” are limited or excluded; and - you take on risk, responsibilities and liability. You accept that various things can go wrong when using the Website/application and/or the Service, and/or when viewing and/or using the Content. You take on the responsibility and liability of these events happening and will have no claim against “Rush for Less” if they happen. When using the Website/application, you will be exposed to Content from a variety of sources, and that, as far as the law allows, “Rush for Less” is not responsible for the accuracy, usefulness, safety, or intellectual property rights of or relating to such Content, and you agree and assume all liability for your use. You further may be exposed to Content that is inaccurate, offensive, indecent, objectionable, defamatory or libelous and, as far as the law allows, and subject to Section 19, you agree to waive, and hereby do waive, any legal or equitable rights or remedies you have or may have against “Rush for Less” with respect thereto. This Section 10 has important legal consequences for you. In this section: - the legal responsibilities and liability of “Rush for Less” are limited or excluded; - the rights or remedies you may have against “Rush for Less” are limited or excluded; and - you take on risk, responsibilities and liability. - you indemnify “Rush for Less” and other persons against liability and claims. As far as the law allows, and subject to Section 19, you agree to defend, indemnify and hold harmless “Rush for Less”, its officers, subsidiaries, affiliates, successors, assigns, directors, officers, agents, service providers, suppliers and employees, from and against any and all claims, damages, obligations, losses (whether direct, indirect or consequential), liabilities, costs or debt, and expenses (including but not limited to attorneys' fees) arising from: (i) your violation of any provision of these Terms; (ii) your violation of any third party right, including without limitation any copyright, trademark, trade secret or other property, or privacy right; or (iii) any claim that your Content caused damage to a third party. As far as the law allows, and subject to Section 19, this defense and indemnification obligation will survive termination, modification or expiration of these Terms and your use of the Service and the Website/application. This Section 11 has important legal consequences for you. In this section, you take on risk, responsibilities and liability. This may result in you being punished under applicable criminal laws, and/or you becoming financially liable to “Rush for Less” and/or other persons for additional amounts. You understand and agree that sending unsolicited email advertisements or other unsolicited communications to “Rush for Less” email addresses or through “Rush for Less” computer systems are expressly prohibited by these Terms. You acknowledge and agree that from time to time “Rush for Less” may monitor email usage using human monitors or automated software to flag certain words associated with spam or scams in emails that are sent between one user to another in the “Rush for Less” e-mail system. Any communication between yourself and any other user utilizing the communication features available on the Service and the Website/application may be used only in accordance with the Terms. Any unauthorized use of “Rush for Less” computer systems is a violation of these Terms and certain applicable laws. Such violations may subject the sender and his or her agents to civil and criminal penalties. 12.1 This Section 12 has important legal consequences for you. In this section: - the legal responsibilities and liability of “Rush for Less” are limited or excluded; - the rights or remedies you may have against “Rush for Less” are limited or excluded; and - you take on risk, responsibilities and liability. As far as the law allows, and subject to Section 19, “Rush for Less” shall not be liable for your interactions with any organizations and/or individuals on the Website/application or through the Service. This includes, but is not limited to, payment and delivery of goods and services, and any other terms, conditions, warranties or representations associated with any interaction you may have with other organizations and/or individuals. These dealings are solely between you and such organizations and/or individuals. As far as the law allows, and subject to Section 19, “Rush for Less” shall not be responsible or liable for any loss or damage of any sort incurred as the result of any such dealings or interactions. In the event that you have a dispute with one or more other users, as far as the law allows, and subject to Section 19, you hereby release “Rush for Less”, its officers, employees, agents and successors from any and all claims, demands and damages (actual and consequential) of every kind or nature, known or unknown, suspected and unsuspected, disclosed and undisclosed, arising out of or in any way related to such disputes and/or our Service. This Section 13 has important legal consequences for you. In this section: - the legal responsibilities and liability of “Rush for Less” are limited or excluded; - the rights or remedies you may have against “Rush for Less” are limited or excluded; and - you take on risk, responsibilities and liability. “Rush for Less” may establish limits from time to time concerning use of the Service, including among others, the maximum number of days that Content will be maintained or retained by the Service, the maximum number and size of postings, e-mail messages, or other Content that may be transmitted or stored by the Service, and the frequency with which you may access the Service or the Website/application. As far as the law allows and subject to Section 19, “Rush for Less” has no responsibility or liability for the deletion or failure to store any Content maintained or transmitted by the Website/application or the Service. “Rush for Less” reserves the right at any time to modify or discontinue the Service (or any part thereof) with or without notice, and that “Rush for Less” shall not be liable to you or to any third party for any such modification, suspension or discontinuance of the Service. You acknowledge and agree that “Rush for Less”, in its sole and absolute discretion, has the right (but not the obligation) to delete or deactivate your account, block your e-mail or IP address, or otherwise terminate your access to or use of the Service (or any part thereof), immediately and without notice, and remove and discard any Content within the Service, for any reason or no reason at all. Further, as far as the law allows, and subject to Section 19, you agree that “Rush for Less” shall not be liable to you or any third-party for any termination of your access to the Website/application or the Service. These Terms, and any rights and licenses granted hereunder, may not be transferred or assigned by you, but may be assigned by “Rush for Less” without restriction. Any assignment or transfer by you shall be null and void. This Website/application is intended only for adults and that you are eligible to contract as per applicable laws. If you are using/accessing this Website/application as a representative of any person/entity, you acknowledge that you are legally authorized to represent that person/entity. Minors are only allowed to access the Website/application and use the Service, in the event of approval of their legal representatives or in the event that it concerns an act or a transaction that is usual and acceptable standard in civil life and practice. You affirm that you are either at least 18 years of age, or an emancipated minor, or possess legal parental or guardian consent, and are fully able and competent to enter into the terms, conditions, obligations, affirmations, representations, and warranties set forth in these Terms, and to abide by and comply with these Terms. These Terms and the other policies posted on the Website/application constitute the complete and exclusive understanding and agreement between you and “Rush for Less” and govern your use of the Service and the Website/application superseding all prior understandings, proposals, agreements, negotiations, and discussions between the parties, whether written or oral. Any claim you may have against “Rush for Less” must be submitted to the exclusive jurisdiction of the courts located within the Lebanon. The failure of “Rush for Less” to exercise or enforce any right or provision of the Terms shall not constitute a waiver of such right or provision. If any provision of the Terms is found by a court of competent jurisdiction to be invalid (including, without limitation, because such provision is inconsistent with the laws of another jurisdiction) or inapplicable, the parties nevertheless agree that the court should endeavor to give effect to the parties' intentions as reflected in the provision. If any provision or provisions of these Terms is held to be invalid, illegal or unenforceable, the validity, legality and enforceability of the remaining provisions of the Terms shall not in any way be affected or be impaired. YOU AGREE THAT ANY CAUSE OF ACTION BROUGHT BY YOU AND ARISING OUT OF OR RELATED TO YOUR USE OF THE SERVICE AND/OR THE WEBSITE/APPLICATION MUST COMMENCE WITHIN A REASONABLE TIME AND IN ANY EVENT NO LATER THAN SIX MONTHS AFTER THE CAUSE OF ACTION ACCRUES. These Terms shall inure to the benefit of and be binding upon each party's successors. This Section 17 has important legal consequences for you. In this section: - the legal responsibilities and liability of “Rush for Less” are limited or excluded; - the rights or remedies you may have against “Rush for Less” are limited or excluded; and - you take on risk, responsibilities and liability. This may result in you becoming financially liable to “Rush for Less” for additional amounts. The statements made in this section also constitute acknowledgements of fact by you. You must read these statements carefully and ensure they are correct, as you will not be able to deny the truth of the statements. “Rush for Less” and/or other persons may have claims and other rights against you as a result of these statements. Please report any violations of the Terms that you become aware of by contacting us using the link at the bottom of the Website/application's homepage at www. RushForLess.com. Any failure to act by “Rush for Less” with respect to a breach by you or others does not waive our right to act with respect to subsequent or similar breaches by you or others. This Section 18 has important legal consequences for you. In this section: - the legal responsibilities and liability of RushForLess are limited or excluded; - the rights or remedies you may have against “Rush for Less” are limited or excluded; and - you take on risk, responsibilities and liability. There are things that may go wrong when using the Website/application and/or the Service, including what is listed in this Section 18. “Rush for Less” is not responsible (liable) for anything that goes wrong, including what is listed in this Section 18. You use the Website/application and the Service knowing and accepting that these things can go wrong and that there are risks. AS FAR AS THE LAW ALLOWS, AND SUBJECT TO SECTION 19, YOU EXPRESSLY ACKNOWLEDGE AND AGREE THAT USE OF THE WEBSITE/APPLICATION AND THE SERVICE IS ENTIRELY AT YOUR OWN RISK AND THAT THE WEBSITE/APPLICATION AND THE SERVICE ARE PROVIDED ON AN "AS IS" OR "AS AVAILABLE" BASIS, WITHOUT ANY WARRANTIES OF ANY KIND. ALL EXPRESS AND IMPLIED WARRANTIES, INCLUDING, WITHOUT LIMITATION, THE WARRANTIES OF MERCHANTABILITY, FITNESS FOR A PARTICULAR PURPOSE, AND NON-INFRINGEMENT OF PROPRIETARY RIGHTS ARE EXPRESSLY DISCLAIMED TO THE FULLEST EXTENT PERMITTED BY LAW. TO THE FULLEST EXTENT PERMITTED BY LAW, “Rush for Less”, ITS OFFICERS, DIRECTORS, EMPLOYEES, AND AGENTS DISCLAIM ALL WARRANTIES, EXPRESS OR IMPLIED, IN CONNECTION WITH THE WEBSITE/APPLICATION AND YOUR USE THEREOF. “Rush for Less” MAKES NO WARRANTIES OR REPRESENTATIONS ABOUT THE ACCURACY OR COMPLETENESS OF THE WEBSITE/APPLICATION'S CONTENT OR THE CONTENT OF ANY THIRD PARTY WEBSITE/APPLICATIONS LINKED TO THE WEBSITE/APPLICATION AND ASSUMES NO LIABILITY OR RESPONSIBILITY FOR ANY (I) ERRORS, MISTAKES, OR INACCURACIES OF CONTENT, (II) PERSONAL INJURY OR PROPERTY DAMAGE, OF ANY NATURE WHATSOEVER, RESULTING FROM YOUR ACCESS TO AND USE OF THE WEBSITE/APPLICATION AND SERVICE, (III) ANY UNAUTHORIZED ACCESS TO OR USE OF OUR SERVERS AND/OR ANY AND ALL PERSONAL INFORMATION AND/OR FINANCIAL INFORMATION STORED THEREIN, (IV) ANY INTERRUPTION OR CESSATION OF TRANSMISSION TO OR FROM THE WEBSITE/APPLICATION, (IV) ANY BUGS, VIRUSES, TROJAN HORSES, OR THE LIKE WHICH MAY BE TRANSMITTED TO OR THROUGH THE WEBSITE/APPLICATION BY ANY THIRD PARTY, AND/OR (V) ANY ERRORS OR OMISSIONS IN ANY CONTENT OR FOR ANY LOSS OR DAMAGE OF ANY KIND INCURRED AS A RESULT OF THE USE OF ANY CONTENT POSTED, EMAILED, COMMUNICATED, TRANSMITTED, OR OTHERWISE MADE AVAILABLE VIA THE WEBSITE/APPLICATION OR THE SERVICE. “Rush for Less” DOES NOT WARRANT, ENDORSE, GUARANTEE, OR ASSUME RESPONSIBILITY FOR ANY PRODUCT OR SERVICE ADVERTISED OR OFFERED BY A THIRD PARTY THROUGH THE WEBSITE/APPLICATION OR ANY HYPERLINKED WEBSITE/APPLICATION OR FEATURED IN ANY BANNER OR OTHER ADVERTISING, AND “Rush for Less” WILL NOT BE A PARTY TO OR IN ANY WAY BE RESPONSIBLE FOR MONITORING ANY TRANSACTION BETWEEN YOU AND/OR OTHER USERS AND/OR THIRD-PARTY PROVIDERS OF PRODUCTS OR SERVICES. AS WITH THE PURCHASE OF A PRODUCT OR SERVICE THROUGH ANY MEDIUM OR IN ANY ENVIRONMENT, YOU SHOULD USE YOUR BEST JUDGMENT AND EXERCISE CAUTION WHERE APPROPRIATE. AS FAR AS THE LAW ALLOWS, AND SUBJECT TO SECTION 19, IN NO EVENT SHALL “Rush for Less”, ITS OFFICERS, DIRECTORS, EMPLOYEES, OR AGENTS, BE LIABLE FOR DIRECT, INDIRECT, INCIDENTAL, SPECIAL, CONSEQUENTIAL OR EXEMPLARY DAMAGES (EVEN IF “Rush for Less” HAS BEEN ADVISED OF THE POSSIBILITY OF SUCH DAMAGES), RESULTING FROM ANY ASPECT OF YOUR USE OF THE WEBSITE/APPLICATION OR THE SERVICE, INCLUDING WITHOUT LIMITATION WHETHER THE DAMAGES ARISE FROM USE OR MISUSE OF THE WEBSITE/APPLICATION OR THE SERVICE, FROM INABILITY TO USE THE WEBSITE/APPLICATION OR THE SERVICE, OR THE INTERRUPTION, SUSPENSION, MODIFICATION, ALTERATION, OR TERMINATION OF THE WEBSITE/APPLICATION OR THE SERVICE, (iv) ERRORS, MISTAKES, OR INACCURACIES OF CONTENT, (v) PERSONAL INJURY OR PROPERTY DAMAGE RESULTING FROM YOUR ACCESS TO AND USE OF THE WEBSITE/APPLICATION AND SERVICE, (vi) ANY UNAUTHORIZED ACCESS TO OR USE OF OUR SERVERS AND/OR ANY AND ALL PERSONAL INFORMATION AND/OR FINANCIAL INFORMATION STORED THEREIN, (vii) ANY INTERRUPTION OR CESSATION OF TRANSMISSION TO OR FROM THE WEBSITE/APPLICATION, (viii) ANY BUGS, VIRUSES, TROJAN HORSES, OR THE LIKE WHICH MAY BE TRANSMITTED TO OR THROUGH THE WEBSITE/APPLICATION BY ANY THIRD PARTY, (ix) ANY ERRORS OR OMISSIONS IN ANY CONTENT, (x) ANY LOSS OR DAMAGE OF ANY KIND INCURRED AS A RESULT OF THE USE OF ANY CONTENT POSTED, EMAILED, COMMUNICATED, TRANSMITTED, OR OTHERWISE MADE AVAILABLE VIA THE WEBSITE/APPLICATION OR THE SERVICE. SUCH LIMITATION OF LIABILITY SHALL ALSO APPLY WITH RESPECT TO DAMAGES INCURRED BY REASON OF OTHER SERVICES OR PRODUCTS RECEIVED THROUGH OR ADVERTISED IN CONNECTION WITH THE WEBSITE/APPLICATION OR THE SERVICE OR ANY LINKS ON THE WEBSITE/APPLICATION, AS WELL AS BY REASON OF ANY INFORMATION, OPINIONS OR ADVICE RECEIVED THROUGH OR ADVERTISED IN CONNECTION WITH THE WEBSITE/APPLICATION OR THE SERVICE OR ANY LINKS ON THE “Rush for Less” SITE. THESE LIMITATIONS SHALL APPLY TO THE FULLEST EXTENT PERMITTED BY LAW. AS FAR AS THE LAW ALLOWS, AND SUBJECT TO SECTION 19, YOU SPECIFICALLY ACKNOWLEDGE AND AGREE THAT “Rush for Less” SHALL NOT BE LIABLE FOR USER SUBMISSIONS OR THE DEFAMATORY, OFFENSIVE, OR ILLEGAL CONDUCT OF ANY USER OR THIRD PARTY AND THAT THE RISK OF HARM OR DAMAGE FROM THE FOREGOING RESTS ENTIRELY WITH YOU. “Rush for Less” MAKES NO REPRESENTATIONS OR WARRANTIES THAT THE WEBSITE/APPLICATION IS APPROPRIATE FOR USE IN OTHER LOCATIONS. THOSE WHO ACCESS OR USE THE WEBSITE/APPLICATION FROM OTHER JURISDICTIONS DO SO AT THEIR OWN VOLITION AND RISK AND ARE RESPONSIBLE FOR COMPLIANCE WITH LOCAL LAW. Account and Profile Information: When you use our Services, we may require and use certain information such as a valid email address and password. In addition, users may create a profile that includes information such as their geography, first and last name, gender, phone number, email, credit card information, interests and associated information, including photos they may wish to upload. Any information users share in publicly-available profiles is their own responsibility. You should carefully consider the risks of making certain personal information—particularly information such as address or precise location information—publicly available. Listings and Transactions: We may host the information, including personal information and contact information, valid contact information and password necessary to provide our Services. Much of the same information used to create an account or profile may be required to post a listing. Any information users share in listings is their own responsibility. Like with profiles, users should carefully consider the risks of making certain personal information—particularly information such as address or precise location information—publicly available in a listing. We may also process information related to the effectiveness of our advertising campaigns, including what ads are viewed and clicked either on our network or on third-party sites. Customer Care: When you contact our customer care department, we may collect the personal information necessary to fulfil your request and to contact you for follow up as needed. We may also contact you using existing account contact information you provide to us for this purpose. We may also collect other information about our communications with our users, for example any user support requests that our users make or any feedback that our users provide to us. Website/application and Mobile Data: We may automatically receive and log information on our servers from your browser or device including your IP address, software and hardware attributes, pages that you request, mobile identifiers, information about app usage, and other device or systems-level information. This can occur on our website/application or mobile app, or on third parties’ services. Appended Information: We may also append information we lawfully obtain from business partners or third parties to existing data we hold about our users. Access, Correction and Deletion: For users that have created an account or listing with us, you can access, correct or delete your personal information by writing to us at the following address: info@rushforless.com. You are responsible for keeping the data you provide or post on our network accurate. Cookies: Most major desktop and mobile web browsers (e.g. Safari, Firefox, Internet Explorer, Chrome, Opera) provide controls that allow you to limit or block the setting of cookies on your systems. Note that disabling cookies in your browser for either first-party domains (the sites you actively visit) or third-party domains (companies other than those you directly visit on the Web) may result in decreased functionality in certain instances. IN NO EVENT SHALL “Rush for Less”, ITS OFFICERS, DIRECTORS, EMPLOYEES, OR AGENTS, BE LIABLE FOR DIRECT, INDIRECT, INCIDENTAL, SPECIAL, CONSEQUENTIAL OR EXEMPLARY DAMAGES (EVEN IF “Rush for Less” HAS BEEN ADVISED OF THE POSSIBILITY OF SUCH DAMAGES), RESULTING FROM ANY ASPECT OF YOUR USE OF THE WEBSITE/APPLICATION OR THE SERVICE, INCLUDING WITHOUT LIMITATION WHETHER THE DAMAGES ARISE FROM USE OR MISUSE OF THE WEBSITE/APPLICATION OR THE SERVICE, FROM INABILITY TO USE THE WEBSITE/APPLICATION OR THE SERVICE, OR THE INTERRUPTION, SUSPENSION, MODIFICATION, ALTERATION, OR TERMINATION OF THE WEBSITE/APPLICATION OR THE SERVICE. SUCH LIMITATION OF LIABILITY SHALL ALSO APPLY WITH RESPECT TO DAMAGES INCURRED BY REASON OF OTHER SERVICES OR PRODUCTS RECEIVED THROUGH OR ADVERTISED IN CONNECTION WITH THE WEBSITE/APPLICATION OR THE SERVICE OR ANY LINKS ON THE WEBSITE/APPLICATION, AS WELL AS BY REASON OF ANY INFORMATION, OPINIONS OR ADVICE RECEIVED THROUGH OR ADVERTISED IN CONNECTION WITH THE WEBSITE/APPLICATION OR THE SERVICE OR ANY LINKS ON THE “Rush for Less” SITE. THESE LIMITATIONS SHALL APPLY TO THE FULLEST EXTENT PERMITTED BY LAW. YOU SPECIFICALLY ACKNOWLEDGE AND AGREE THAT “Rush for Less” SHALL NOT BE LIABLE FOR USER SUBMISSIONS OR THE DEFAMATORY, OFFENSIVE, OR ILLEGAL CONDUCT OF ANY USER OR THIRD PARTY AND THAT THE RISK OF HARM OR DAMAGE FROM THE FOREGOING RESTS ENTIRELY WITH YOU. RushForLess team is here to provide you with more information, answer any questions you may have and create an effective solution for your needs.